"Examining everyday objects within the home, I aim to alter or combine forms in ways to illustrate their emotional significance. Some of my sculptures are designed to personify the object or display a human presence, while other pieces aim to evoke an emotional understanding with the viewer from the objects alone." JENNIFER HALVORSON (b. 1984) is an artist and educator. Born in St. Louis, she earned dual B.F.A. degrees in Metal and Glass at the University of Illinois, Urbana-Champaign. In 2005, she also studied abroad at the Australian National University in Canberra. After completing her undergraduate studies, Jennifer traveled to Denmark as a Fulbright Scholar. She continued studying glass at Danmarks Designskole in Copenhagen and became assistant to glass artist Steffen Dam and Micha Karslund. Jennifer earned her Master of Fine Arts in Glass from the Rochester Institute of Technology, within the School for American Crafts. 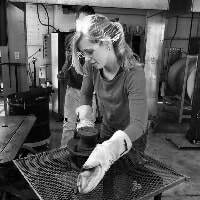 She was a resident artist at Wheaton Arts and Cultural Center in fall 2010, and a visiting scholar within the glass department at Southern Illinois University, Carbondale spring 2011. Jennifer's work has been exhibited internationally throughout the United States and Europe. Her work has been featured in New Glass Review 32 and 35, published by the Corning Museum of Glass, and exhibited at SOFA Chicago, fall 2013, 2016 and 2017. Jennifer Halvorson’s sculptures revolve around objects that are manipulated or collaged to express uneasy emotions that occur within the individual. Instruct undergraduate glass courses surveying blowing, fusing, casting and cold working. Instruct beginning sculpture and metal course covering modeling and fabrication. Instruct Graduate Seminar courses. Served as Graduate Coordinator working on the development and organization of MFA program. Taught “Casting on a Different Plane, Press Molds”, one-week kiln cast workshop. Gave a presentation and demonstrations on the press mold process. Gave two lectures, one on my work and one of kiln cast press molds. Instructed two day press mold workshop to 12 second year students and 8 graduate students. Presented a lecture on my work as well as the process of kiln cast press molds. Assist with “Internal Structures”, one week kiln cast workshop. Presented a lecture on my work and solo exhibition that was installed in the university gallery. Gave presentations and demonstrations on honeycomb mold making as well as press molds. Assist with “Transparent Metamorphosis”, three week kiln forming and casting workshop. Involved in graduate critiques throughout the semester. Instruct one week press mold workshop for students within the glass department. Assist in glass hot shop and cold shop for a four month period. 2017 “The Original Approach to Rapid Production: Fenton Glass Company and the Potential of Pressed Glass”. examines the experience of a flower from 24 angles”.